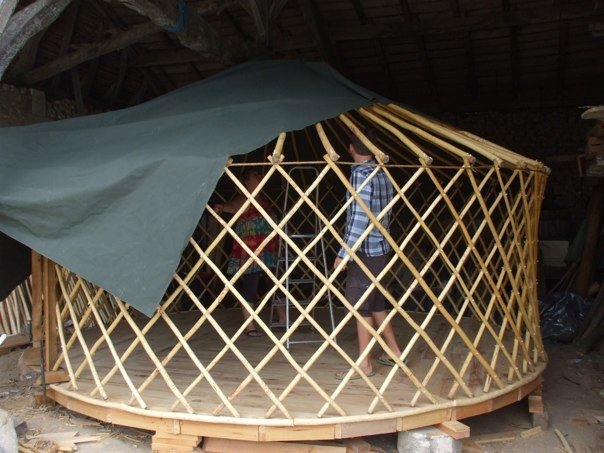 The deadline for the Bodgers’ yurt is today and unfortunately we are not ready! Thankfully my lovely wife is much more realistic and organised than me so she has secretly kept another yurt available in the event that we might need to juggle bookings around – not ideal but I can’t see anyone minding being in the Grand Abri yurt but especially at the moment as the sunflowers are out in the field just below, so the view is spectacular! The problems started when we decided that the shower had to be positioned outside the roundhouse perimeter which involved digging another section out of the hillside. 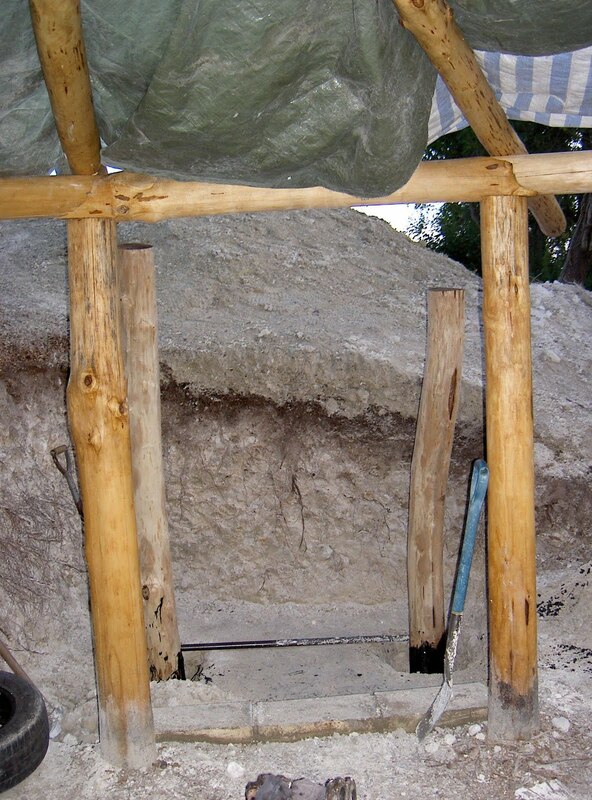 This in itself wasn’t a big deal but by creating a cubicle we had our first corner, and therefore, stress point in the roundhouse. To overcome this we needed strong chunky carpentry again not a problem, just time consuming, so thanks Wendy for giving us that two week cushion! To say that the last month has been busy is a massive understatement but it has been an absolute joy to see the building come on so quickly. Once the main timber framing was finished, I went off in search of old car tyres, which lead to yet another classic french moment of me trying to explain why I wanted old car tyres, (well you try explaining about hobbit houses and earth-ship building to the man at the garage) it all ended with that gallic shrug and a mutter of “comme tu veut”. 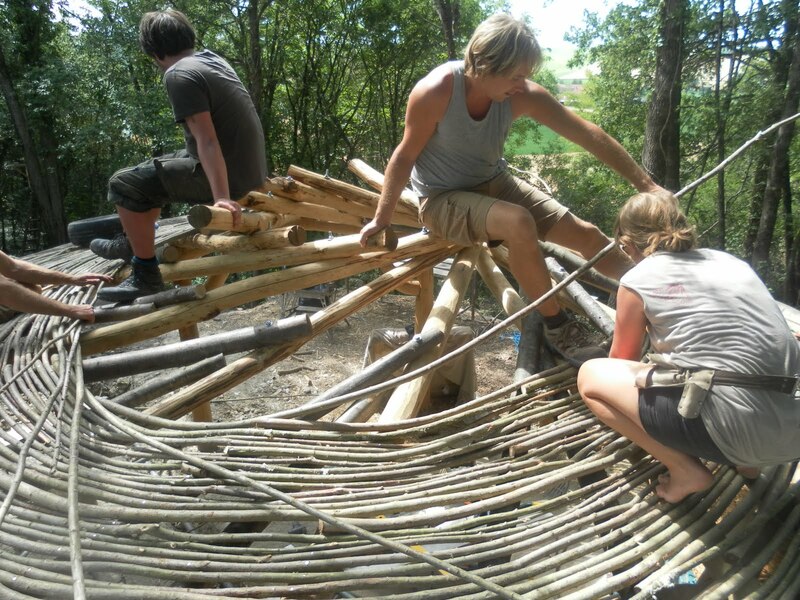 Once in place they were rammed with stones forming the foundations of our straw-baled walls and they were then all compressed and spiked (with pointed willow rods) as best we could. The protective and waterproof membranes and also the land drainage were then carefully fitted as it is critical that the straw bales stay dry. It was decided at this point that Sam was the skinniest person around so he had to climb down between the bales and the excavated rock to organise membranes, drainage and careful placement of the soil, which was then filled up to henge level, compressing the bales still further and giving them a real feeling of strength and solidity. With the bales in and safe from the elements, we could concentrate once again on the roof. After much deliberation we decided to use large willow wands in a swirling pattern (almost like french randing a basket) which had the effect of smoothing out some of the deviations in the rafter levels, creating a neat look to the underside. We could then carry on pulling the protective and damp-proof membranes over the willow before the soil went on the roof – it took about 7 tons for the building to be sufficiently buried but the resulting structure instantly had a more cosy feel to it! 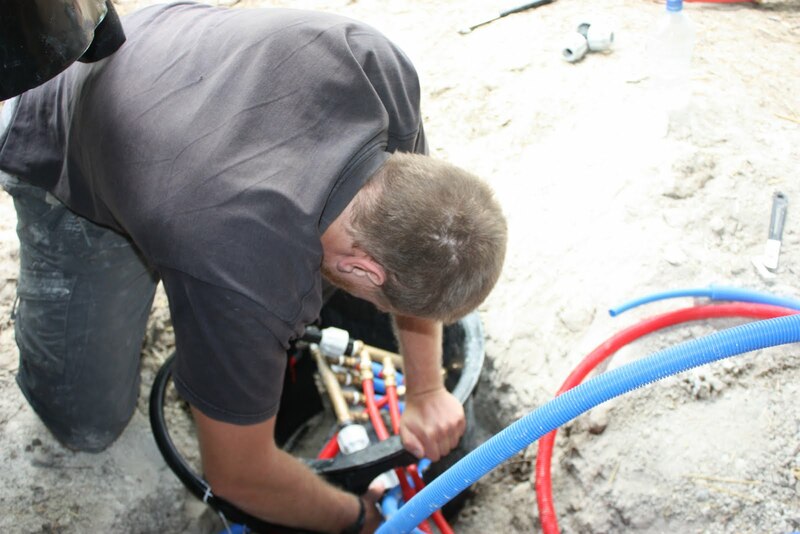 In the meantime Ben was busying himself with the first fix plumbing involving three hot and three cold water feeds, plumbing in our home-made solar panel and fitting it on to the roof to get optimum sunlight. 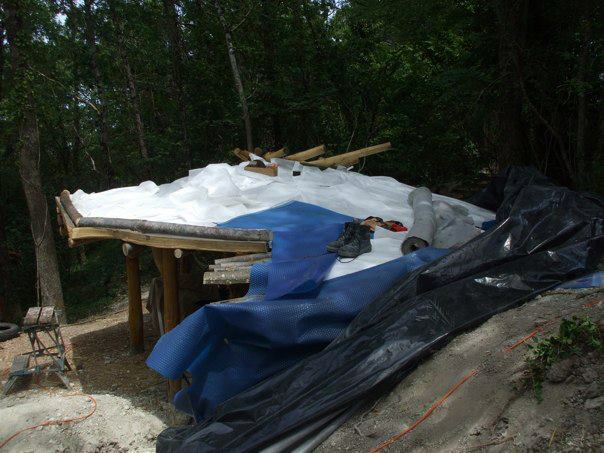 And whilst everything has been busy down in the woods, Wendy has been tailor making the yurt cover up at the house. The walls are reasonably straight forward but the roof can be awkward and used to require several fittings. Nowadays Wendy seems to be able to throw the part-made canvas on and make a few deft marks with her chalk here and there which makes no sense to me, bringing a mass of material back to her machine and turning it into a snuggly fitting roof cover with only three or four fittings, it’s a bit of a Harry Potter dark art. She has also been very busy as ever sorting out all of the furniture for the yurt and roundhouse which involves lots of cleaning and restoration and painting as most of the stuff has to be lovingly restored having been found at vide greniers or brocantes, or donated for reuse! Two weeks to go and even with the extra time it is going to be right down to the wire to get it ready for the first Bodgers! Got to go and get on, next time I write it will all be done!